Has Google proven it can handle its own retail stores? So, word just came out that Google may be working on opening its own chain of retail stores in major metropolitan centers by the holiday season this year. In theory, it sounds like an idea with amazing potential - centralized places where you can go and play with Nexus devices, Chromebooks, and the fabled Google Glass. The trouble is that Google's real-world history with retail makes us skeptical as to whether Google has proven it can handle its own retail stores. Of course, we're all familiar with the recent troubles that Google has had with keeping the Nexus 4 and Nexus 10 in stock, and all signs point to that issue being caused by Google simply underestimating either the demand for the products, or underestimating the willingness of customers to purchase hardware sight-unseen from the Play Store. The second reason is more understandable, because Google's history with selling the Nexus One and the Galaxy Nexus directly to consumers may have given the company low estimates in that regard. The first reason would be one that is much more troubling. The first reason also seems relatively plausible, because beyond the troubles with keeping the Nexus 4 and Nexus 10 in stock, Google has also had quite a bit of trouble keeping the new Samsung Chromebook in stock; and, while we may love Chrome OS, the demand for Chromebooks is nowhere near comparable to the demand for the new Nexus devices. How fast can Google learn retail? Patrick Gibson, who helped to build the original iPad, is famous for saying "Google is getting better at design faster than Apple is getting better at web services." This is true, and it's a big reason why even at the high end, Android is beating iOS. Larry Page has made a concerted effort to build a culture of design in Google, which has started to pervade every product that the company makes. The question is though: how fast can Google get better at retail? Google is still relatively new to the retail game, and relatively new to the supply chain side of things as well. Google has been a software company for the majority of its existence, and has only sold a couple of devices directly to consumers before the big push this past year with the rebranding of the Android Market into the Google Play Store. The Nexus One was definitely a niche product with very low demand. The Galaxy Nexus was far more successful as sold internationally and through Verizon than it was sold directly from Google. And, we've already talked about the troubles with the new line of Nexus devices and Chromebooks. The only device that Google has had in stock more often than not is the Nexus 7. Luckily, Google seems to understand that it needs help in this endeavor, and according to the rumor, Google is only really building the point-of-sale systems in-house, and "most of the ramping up of these stores will be done by an outside agency". 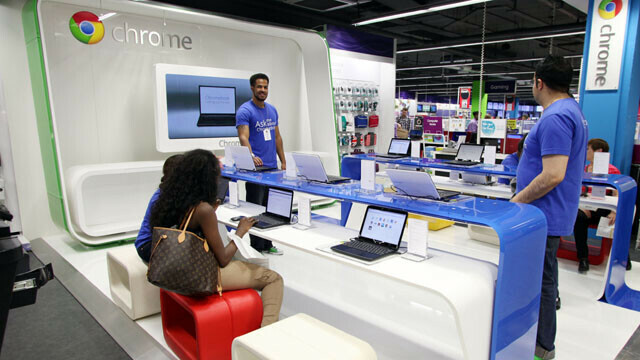 And, Google has had experience running the "store-within-a-store" model with Chrome OS sections in Best Buy stores in various locations. Of course, that only covers the actual stores themselves, and doesn't answer the issue of supply chain, and making sure those stores have devices on the shelves. Although, from what we've seen since the Nexus 4 has made it back into the Play Store this last time, maybe Google has already sorted out that side of things as well. While we don't want to call it proof that Google has sorted out its supply chain issues, the Nexus devices have been in the Play Store for over 2 weeks straight now without being sold out. That is far better than what we originally saw with the new line of Nexus devices, but it would be more comforting if the Nexus 4 could get more efficient than "shipping in 1 to 3 weeks". We've seen this before of course. Apple's stores have been successful, but of course, Apple has always been a hardware company. The better analogue is Microsoft, which had always been a software company that had dabbled in hardware. Microsoft opened its first retail store in October 2009 with the launch of Windows 7, and it's been a slow roll for the stores. Of course, until the release of the Surface, Microsoft didn't really have any interesting proprietary hardware to sell. Google may not have that either exactly, at least not until Google Glass is released, but at least the Nexus program has developed some amazing hardware, and there will be the almost-Google made Motorola X Phone. Google has proven time and again that it is a company that can fix and learn from mistakes very quickly, and it is a company that knows its strengths and when to look for outside help. That's been the core of the Nexus program so far. Google hasn't been a hardware company, so it partnered with various manufacturers to build devices that represented the "Google experience" of Android. This alone gives us confidence that even with "an outside agency" handling the stores, the Google ethos will be represented, which means that as long as there are devices on the shelves, Google Stores should be very nice indeed. I think it can succeed. By now ppl know what an Android phone, tablet is. Seeing how many ppl take advantage of buying phones from the Play Store....this might help if they keep stores stocked well. I think they knew by 2011 for sure. I might say in 2010. The "store within a store" will be a much better idea; put it in best buys. It's cheaper, easier, and can reach a much wider audience than just opening 1 personal store in a few major cities. The only reason why I don't think this is a good idea is because Best Buy is on its way out. Big box electronic retailers are struggling to keep up but a store in major metropolitan areas and in popular malls can do very well. I'm with you. I don't think it is good idea to have physical store because it is good for Google kind of but now consumer have to pay more. 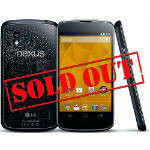 For example the nexus 4 we can buy for 300 8gb model but that will be change if buy it at store. Google will have put money into build store hide employee, eletricity etc that monthly mantaince got to come from customer. I think it's a good idea. A store that has chromebooks, tablets, android phones, and accessories. If they have a genius style bar for troubleshooting I see it performing well. Google just needs better manufactures, LG just isn't used to one of their smartphones selling so well. LOL "Amazon Market into the Google Play Store"
not a Google store but an Android store....will they sale only Nexuses? Someone forgot about Chromebooks and GTV, and coming soon Google Glasses. Who knows what else they have up their sleeve. I consult in retail, and I can say that it really can be difficult to get it right. The strange thing is that so many people have been saying that online buying will be the death of traditional retailing, yet we now have Apple, Microsoft and just lately Google jumping into the world of physical retailing. True, the internet has ensured it will never be the same, but the concept of going to a location to experience certain types of products before purchasing will have appeal for generations to come. The question is not whether Google can handle retail stores, but what do they have in store for the future so they want to go physical? The likely answer is Motorola, with their experience and sorta-Google devices coming out, it's only natural that GOOG represents itself in the physical world, after all, they have quite a number of own label gadgets now, and a mobile company. Walking into a store and picking up a Nexus device you can try out, all at online price, sounds pretty awesome. Will this store sale just "made for Google" devices or every device that runs the OS? It would be nice to demo all Android products under one roof from phones and tablets to cases and accessories. Probably just Google (and likely Motorola). I am not sure the average Joe knows so much about google devicea, I mean of course anyone interested in the mobile industry does but my mom, per say, has no clue what a nexus device is and couldn't differentiate a galaxy tab from the nexus. I really do think Google has a way to go in marketing their devices and brick and mortar stores will definitely help with awareness! Google can't even handle Nexus updates appropriately, and now they want to go into retail? Please they pass you a bug to fix an older bug. Junito, Apple is the one that sends buggy updates to fix bugs. I have not ever had any problems with updates on any of my Android devices. Btw, what is the relevance between software updates and retail stores? Oh, and Apple has sh*tty updates yet they have retail stores. Noob. Kid get out of your parents basement more often. Just because you haven't experience any problems with your device, doesn't mean everyone else hasn't. Don't be stupid and do some research. If no one is experiencing any problems, why is Google sending a bug fix for the BT & charging for the GSM GNx in 4.2.2. The problem is, you are as brainwashed (if you have one) as the so called Apple sheep. Oh...for your info just visit Android police and other site and you can read for yourself (if you can) the different problems caused by the updates. lmao @ YOU. You named one device..............................ONE. I work in this business, and it has been rare to see an Android update cause a problem. And are you a pedo? I mean, you called me a kid and all..... Maybe you have lil boys on your mind? PA Moderaters -- Can we get this sick person's acct banned? Sure, he can just create another acct...but it will at least show that his pedophilia is frowned upon. so according to you there are manufacturers that deliver updates quicker and better than google does on its nexus devices???? I'm gonna quit my job with VZW and go work in a Google store!!!!!!!!!!!!!!!!!!!!!!!!!!!!! !